Customised Training – Design & Development – QSIT PVT LTD.
As per estimates, companies that invest $ 1500 per employee on Teaching & Learning Activities earn about 24% more profit vis-a vis organisations with lower training budgets. Essentially what this data means for you is that ,if you expect your human resource pool to perform optimally in a rapidly changing & complex business environment, then you need a robust Training mechanism in place. And traditional approaches to learning solutions are no longer equipped to deal with this scenario. Taking cognisance of this fact, QSIT blends the best elements of the ADDIE model with the iterative elements of an Agile approach; thus delivering effective training programs that can be measured in enhanced employee performances. Florida State University initially developed the “ADDIE” approach ( figure below) to provide a framework to build an effective five phase training & performance support tool. Here the training objectives are clearly identified along with the learning environment & the learner’s existing knowledge & skill sets. This phase deals with creating blueprints by identifying, developing & evaluating a set of planned strategies to attain the project’s goals. Designers create storyboards & graphics by developing, assembling and creating content outlined in the previous phase. In this phase, procedures for training facilitators & learners are developed and training facilitators cover the training curriculum,method of delivery and learning outcomes. 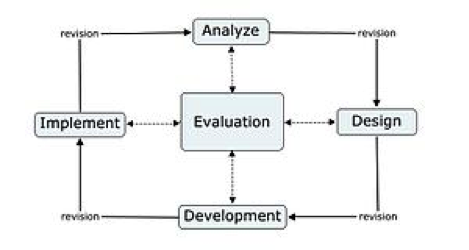 While Formative evaluation is present in each stage of the ADDIE process, summative evaluations is conducted on finished programs. To junk existing learning systems is akin to throwing out the baby with the bathwater. So apart from customising training programs for future requirements, QSIT also helps to evaluate your current learning solutions set up and identify key areas for improvement. These areas could include promoting mobile strategies, moving from live to online / offline training modes, improve effectiveness of E- Learning methodologies and towards building a more interactive & visual approach to content design. One of the other most important pillars of providing effective customised training services is to have an effective training evaluation and measurement system in place. Has the knowledge transfer via training been effective? Is the course content sufficient to deliver positive business results? Which activities need to be monitored to measure training impact? How frequently do these activities need to be monitored?